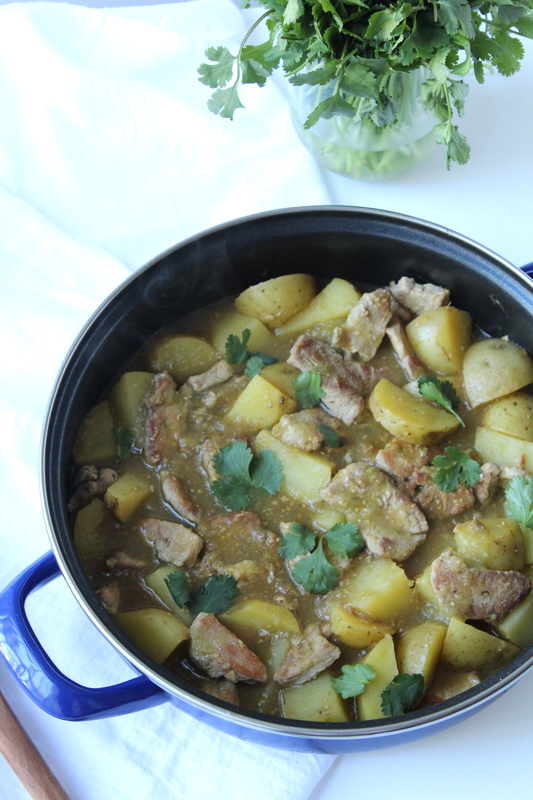 The pork and potatoes are hearty and full of tangy salsa verde flavor. Here is my quick and easy take on a traditional Mexican dish. My poor husband is a super carnivore, but I eat a mostly vegetarian/pescatarian diet. What does that usually mean in our house? A lot of beans, rice, veggies and meatless meals! I am pretty good about cooking seafood, chicken or ground turkey for him, but beef and pork are rarely cooked in our house. Tommy loves pork, and this is one of my favorite ways to cook it for him. This is seriously, a hearty man pleasing meal! Serve with a side of rice, salad or with just a couple of corn or flour tortillas! 1. Cut pork loin chops into bite sized pieces. Sprinkle them lightly with salt, pepper and garlic powder. Add tablespoon of vegetable oil to a large skillet, and heat on medium high heat. Once the skillet is hot, add pork and let brown lightly on one side. This will take 2-3 minutes. Then, stir to cook and brown other sides. Cook pork until it is all lightly browned and mostly cooked through. 2. Next add green salsa, chicken broth and potatoes to the same skillet with the pork. Stir to combine everything. Bring to a boil then reduce heat to medium low. Cover with a lid or tight fitting aluminum foil. Cook for about 20 minutes or until potatoes are soft and pork is fully cooked. Taste for salt and pepper, and adjust if needed. Serve with your favorite side dish or just with a couple of tortillas. • You can use russet potatoes, but I would peel them. Gold potatoes have an amazing creamy texture as well as thin skin so they do not require peeling. • I find Herdez brand salsa at most grocery stores in California including Wal-Mart. Use your favorite brand or homemade green salsa if you have it!